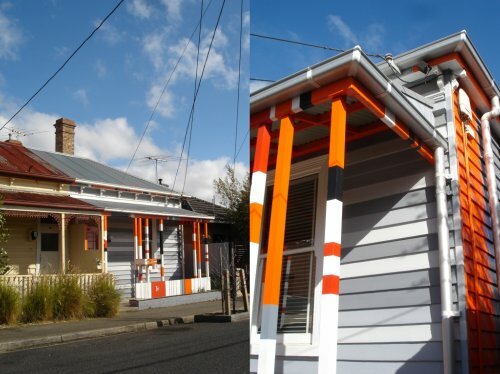 while executing my dress shop stroll by, we came across this happy house in yarraville... now that's a paint job! i can only imagine what a painter would say to me, or more likely about me, if i specified a colour scheme like this for one of my jobs. i can see the cad drawing of the front elevation with little codes all over it in my mind and it's already causing me a near stroke. seriously though, i love turning a corner and discovering something totally different like this. 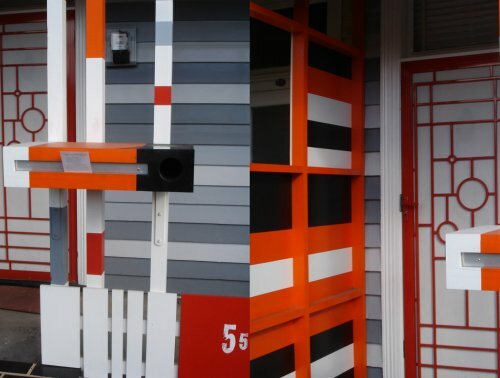 would i paint my own house like this? no, not likely, i'd probably go with white, white and more white, but perhaps with a cheery yellow front door. either a solid timber door painted canary yellow or a timber framed opaque glass door with big canary yellow numbers printed on the glass that look like the numbers from the old petrol price signs.